New York City's Summer Streets program encourages New Yorkers to choose healthy recreation and sustainable transportation. Photo by Tristan Porto. The Alliance for Biking and Walking is partnering with the Street Plan Collaborative to strengthen the expanding Open Streets movement. Making use of roadways in creative and active ways by closing streets to automobiles and allowing residents to walk, bike, skate, dance, and do yoga is catching on in cities around the world, including the United States. To make sure this trend continues strongly, the Alliance for Biking and Walking and Street Plan Collaborative are releasing a print guide and an open-source website to serve as a one-stop source of information and best practices to cities planning to implement Open Streets projects. 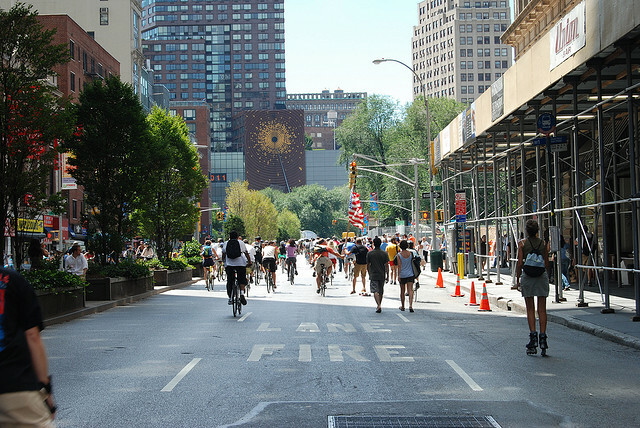 We previously covered open streets events in Washington, D.C., Guadalajara, Mexico, Bogota, Colombia, and Mumbai, India. Most recently we highlighted the very first open streets in Minneapolis, Minn. in our Friday weekly series, TheCityFix Picks. Titled the “Open Streets Project,” the effort by the two organizations relies on research from the Streets Plan Collaborative, and will result in the aforementioned print guide. The document will feature a comprehensive list of all open streets events in the United States and Canada, and will include over 55 case studies to present the elements that make open streets the successful community building tool that it has proven to be. If your city or organization has information to share about an Open Streets initiative in your community, please contact Mike Samuelson, Alliance Member Services and Open Streets Coordinator, at (202) 449-9692 x7 or mike@PeoplePoweredMovement.org. Let’s Start Our Own Ciclovía! Mumbai Joins Other World-Class Cities to Celebrate "Car Free Day"